Marines with November Company, 4th Recruit Training Battalion, at Marine Corps Recruit Depot Parris Island, South Carolina, were the first to don the new uniform, which features a white belt and form-fitting coat with standing collar, during their November graduation ceremony. "All the Marines looked sharp," Marine Corps Systems Command Sgt. Maj. Robin Fortner said. "The uniform represents the United States Marine Corps and its proud, rich legacy, which was exemplified by the Marines." 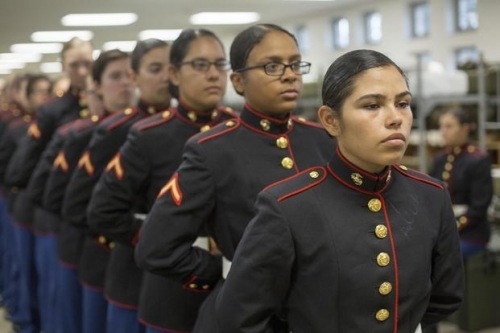 Female Marines have until Sept. 30, 2022, to wear the current women's dress coat, which features an open collar, before they must change over to the new design. The new female dress coat is the result of a 2014 initiative to develop a female uniform similar to the male uniform for a more unified look. Marine Corps Systems Command conducted extensive research with female Marines by visiting I and II Marine Expeditionary Forces and conducting onsite surveys with 2,632 Marines from the National Capital Region; Parris Island; Camp Lejeune and Cherry Point, North Carolina; and the entire West Coast. "It was important for MCSC to get this right for the institution," Fortner said. "I appreciate the diligence that went into this effort from the beginning and the follow-on support to the depot." The third prototype was selected as the final design, said Louis Curcio, Infantry Combat Equipment clothing designer. The main additions are a white belt and standing collar. "Throughout the process, we conducted three different surveys to figure out if the new coat was something Marines actually wanted -- and we only surveyed females," he said. "We gave all of the results to the commandant, and he made the final decision based on their input." Designers also added a seam to the upper-torso area to make the uniform easier to alter to fit different body types. Additionally, the coat was lengthened 1.5 inches to give it more structure and balance with the trousers, which also offer greater range of motion and mobility. "With this change, all Marines will have the uniform of the Corps, and there will be no doubts that they are U.S. Marines in the dress blue uniform," Curcio said.